If you or a loved one is struggling through the throes of drug addiction, you need focused, structured treatment that will be designed around your needs and the requirements of your unique situation and circumstances. Addictions are nuanced and complex, and everyone is different. You need your recovery program to be implemented by people who understand it and people who will care for you with the utmost compassion and diligence. Once you have eliminated all traces of denial, you will be able to overcome this disease first through detox, then through therapy, and finally aftercare services and relapse prevention. 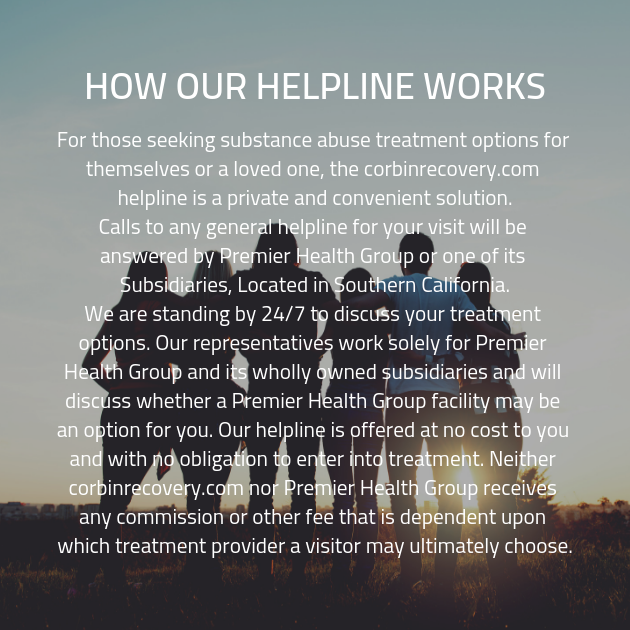 When you first come to a Corbin Recovery drug rehab center, you will enroll in our drug detox clinic for supervised withdrawals. While your body goes through the process of ridding itself of the harmful toxins that have kept you physically dependent upon you drug of choice, you will go through symptoms that won’t be the most pleasant thing in the world. It is important that the professionals who are working with you to monitor your progress and respond accordingly. When you have overcome physical symptoms, you will move on to therapy to begin combating the mental addiction and side effects. Then, in individual therapy you will work with your personal counselor to create a customized addiction treatment program that will be designed around your needs and comprehensively change with them as you go through treatment at our addiction treatment clinic and beyond. This is also where you will go through screening for dual diagnosis mental health issues and any necessary treatment that may be needed. When you are comfortable talking about your condition in private, you will move on to venting and overcoming this condition in group therapy sessions. The group in communal meetings works together to enable each other to avoid triggers, combat cravings, and do away with temptation. During group sessions, you will tell your story, listen to the similar concerns and struggles of others, and exchange valuable insight and advice on recovery and healing issues. The bonds you form here will last with you for a lifetime as you work towards a better life in aftercare and beyond. As you go to leave our substance abuse treatment facility, you will depart with the love and support of everyone you’ve met and with the guidance of your personalized addiction treatment program. The things you’ve learned and the people there for you will stay with you even after you have left the Corbin Recovery drug rehab clinic. We will make sure you have everything you need to have a sustained recovery and to avoid relapse.